I had a roommate in New England whose whole family grew AK -47 on their various hippy farms and communes, and much like the way the Virginia kids in college could always be expected to bring moonshine back with them after breaks, AK-47 was a staple in our house after his holiday trips home. I came to love AK, a strain I have long come to associate with the East coast. A mostly sativa hybrid, it is a fantastically social high, which worked well in our house of 8 people. Cherry Ak’s buds were thick pyramids, faded green in color with barky brown hairs. This harvest was a bit leafy and dry before I even got it home. When I took it out to get a picture, the slim dusting of crystals could be best seen under LED light. The smell is strongly ginger and skunk, which is delightfully undercut by sweetwood and dark berry. Cherry AK is an especially flavorful phenotype of AK-47, equally skunky and fruity sweet. 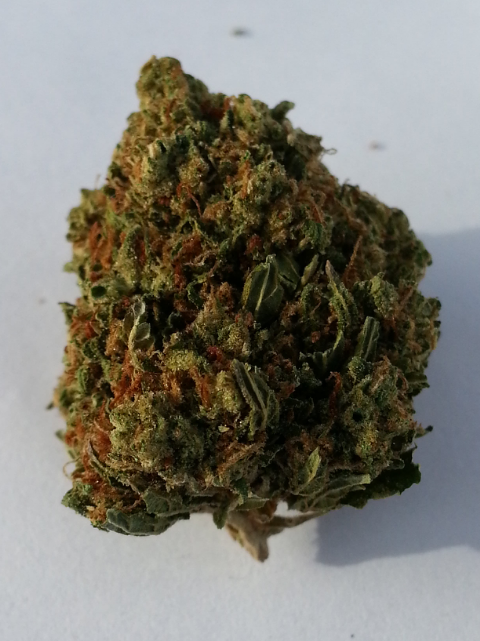 An enjoyable all day medication, Cherry AK-47 is a smooth and relaxing high, mellow and stoney. I had a hard time being productive, despite claims that AK is a creative strain. Patients will find relief from depression and anxiety, as the mind melts away from stressors. There is some indica body effect, but pain relief is minimal. The sativa dominance is apparent in Cherry AK. It fits almost any situation. Peaceful enough for sunrise or sunset; giggly enough for time with friends. It has all the trademark laziness of an anti-weed commercial but is enduringly euphoric and happy.